Yield to all traffic before crossing the intersection. Stop, then enter the intersection when it is safe to do so. Slow down and cross the intersection carefully. A flashing yellow light at an intersection indicates that drivers should slow to a safe and reasonable speed and proceed with caution. When adjusting the driver’s seat for good driving posture, set the seat in an upright position with your body about how far from the steering wheel? Whether or not your vehicle has an airbag, your body should be 10 to 12 inches back from the steering wheel. This will reduce the risk of serious head and neck injuries in the event of a collision. Generally affect only the movement of large vehicles. Can cause problems for all vehicles. While it can create special problems for large vehicles, strong wind can cause problems for all drivers. Wind can lower visibility by blowing dirt and dust into the roadway, but it can sometimes also physically move a vehicle. Backing up is always dangerous because it is hard to see behind your vehicle. Use extra caution when backing up. 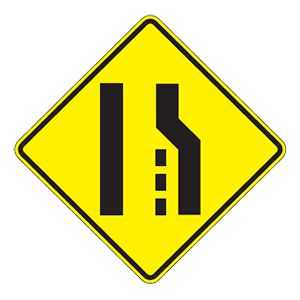 This sign indicates that the right lane ends ahead. A merging maneuver will be required for drivers in that lane.